When working with variables, two views are available in MAXQDA: the variables view and the data view in the Data Editor. The Data Editor is similar to statistics programs in that the data is displayed as a rectangular matrix with a “rows x columns” structure. The variables are displayed in the columns; while the rows display the document variables for documents or the code variables for codes. For document variables the table will contain as many rows as there are documents in the “Document System”; for example, in an interview study, the number of rows will correspond to the number of interviewees. For code variables, the number of rows corresponds to the number of codes, and their subcodes for which code variables were queried. in the “Document System” window, by selecting Overview of Variables in the context menu. When called up at the top level, the table contains all the documents; at the document group level, the data table contains only corresponding documents, and at the document level, only data. A table will appear, in which the selected documents and their corresponding variable values are listed. System variables can be recognized by the black column heading; this cannot be modified in the table. User-defined variables are indicated with a blue heading; their values can be adjusted by double-clicking the appropriate cell. In the Data Editor for Document Variables it is possible to access a document by right-clicking the appropriate row. A context menu will appear which lists the same options for opening the document as in the “Document System”. in the “Code System” window, by selecting Overview of variables in the context menu of a code. If you click on a code, which does not contain subcodes, only the variable values for this code will be listed in the table. If the code contains subcodes, the variables of the subcodes will also be listed. A table will appear which lists the selected codes and their corresponding variable values. An extensive context menu, the same as in the “Code System”, is also available for individual codes. Double-click on the cell of the table where you would like to insert a value. Use the Enter key to jump to the next line to enter the variable values for your variables. Use the Tab key to jump to the next column to enter the values case by case. The values that have already been given to any of the cases in the column are in the drop-down list, sorted alphabetically. You can view this list and select a value from it by clicking on the triangle to the right of the cell you double-clicked on. If the value isn’t available in the drop-down list, you can simply type in the value after double-clicking in the cell. Tip: Drop-down lists are less useful when a variable has many different values (e.g. the exact income of every interviewee). Even if the value was in the drop-down list, it would be faster to type it in than to search for it. 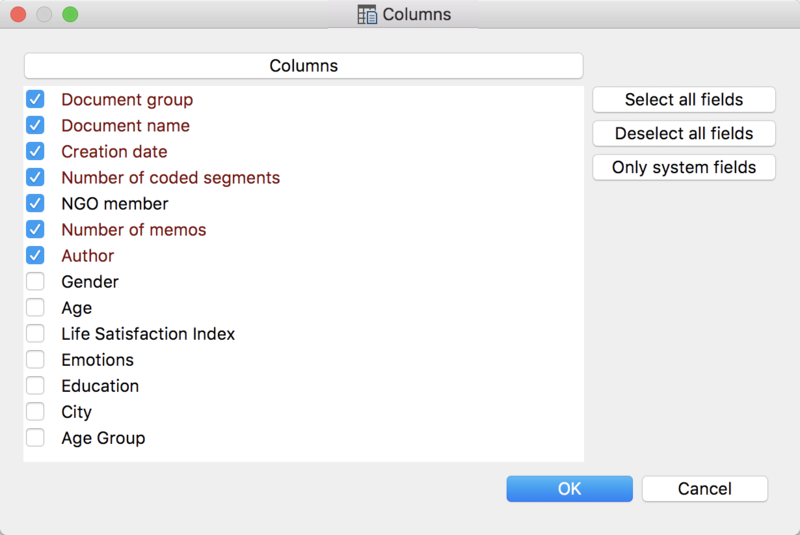 You can stop the program from displaying a column’s drop-down list by right-clicking on the column header and selecting (to uncheck) List of values. List of document variables – switches from the Data view to Variable view. Open as Excel table – generates a table in XLS/X format and opens the program associated with this file format. If specific rows are selected (highlighted in green), only these rows will be displayed, otherwise the entire table will be displayed. Open as HTML table – generates a table in HTML format and opens it in the selected default browser. If specific rows are selected (highlighted in green), only these rows will be displayed, otherwise the entire table will be displayed. Export – a table will be saved in XLS/X, HTML, RTF or TXT (tab-delimited) format, then opened in Excel or in the default browser. If specific rows are selected (highlighted in green), only these rows will be displayed, otherwise the entire table will be exported. If you have created a large number of variables, it quickly becomes difficult to see then entire table at one time. You can view more columns at one time by making the columns thinner (click and drag the separator between column headers), but eventually even this does not suffice. You do, of course, have the option of scrolling to the right, but you can also change the order of the columns by clicking on a column header and dragging it to the location where you would like to have it. It’s easier, though, to simply hide those columns that you aren’t working with. To do so, simply right-click on any column header and choose Select fields. You can then check the boxes next to the columns you would like to view and uncheck the boxes next to the columns you want to be hidden.